How easy is it to detect a VPN is being used? Virtual Private Networks (VPNs) solve a lot of privacy problems. Since a VPN usually encrypts your traffic between your computer and the VPN provider, it makes it very difficult for an observer to view your traffic to see what you’re up to. However, there are many people who want to be able to hide the fact that they’re using a VPN at all; such as people in countries that ban VPNs, or other situations where VPN usage is not generally allowed or blocked through technical means. In this article, we focus on the type of data an observer can collect from network packet captures and how that data can be used to detect VPN use. The burning question is “why”? Who cares if someone discovers you’re running a VPN? If the traffic is heavily encrypted anyhow, what’s the problem? It’s true that in many situations and in many countries, it doesn’t matter at all if an observer detects the use of a VPN. However, there are many countries that ban the use of VPNs and it’s therefore important for VPN users in those countries to know how they can be discovered. In order to determine whether a VPN is in use, an observer has to have access to a router in which the target traffic is passing through. In the case of a targeted victim, an attacker may expend great resources to identify a way in which to take over a router that particular victim uses. In the case of nation-state surveillance, effective detection would require the control of a lot of routers. When you combine those two things—an organisation that cares if you’re using and VPN and also has the ability to control a large number of routers—that usually indicates a nation-level threat actor. Keep in mind that this article deals with ways in which VPN usage can be discovered by observers. It doesn’t necessarily mean that the data encrypted within the VPN tunnel is easier to exploit. I installed packet sniffing software on the OpenWRT router VM and then tested various VPN configurations on the other two virtual machines. The packet sniffing software, tcpdump, allowed me to capture the VMs network traffic for analysis. In a more realistic setup, the packet capturing software would probably be installed in routers on the Internet, or at least within the ISP’s network. The strategic placement of analysis software would require some knowledge of the convergence points of interest on the internet where the target traffic is likely to be flowing. In my testing network, I know with 100% certainty that all the traffic to and from my virtual machines is going to pass through that OpenWRT router. It’s therefore the best place for me to place my collection tools. Not all sources of data that indicate VPN usage are technical. While some are very technical, such as packet analysis, some are very non-technical, such as human error and daily routine. Most VPN users have client software that must be launched in order for the the VPN to be established. It’s very difficult to ensure that no traffic passes over the internet prior to the VPN being established when a computer boots up. Even those VPNs with kill switches may not be able to do anything about traffic that passes during system boot up. 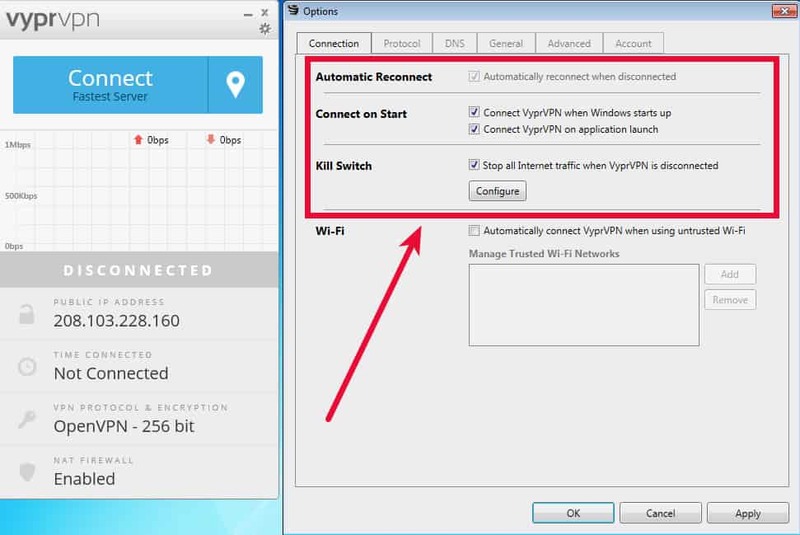 To test this, I set the auto-connect and kill switch options of VyprVPN in the Windows virtual machine. I then shutdown the Windows machine, started a packet capture on the OpenWRT router, and started the Windows machine. That generated a lot of packets and of interest are these two sequences. This suggests that something is trying to enumerate servers. A very common cause of this type of traffic in a VPN scenario is a VPN client attempting to determine the fastest server. One method to do this is to send an ICMP packet (known as a ping) to a set of servers to see which ones comes back the fastest. A logical next step would be to scan those IPs to see what services they are running. I won’t supply details on how to do that, but my testing shows that the default connection banners that most servers display have been removed from the VyprVPN servers so there’s no obvious tell-tale that these IPs are running a VPN server. There isn’t much you can do about how your computer acts prior to being booted up. Therefore, if you want to obfuscate this type of setup sequence, you’ll need to run a VPN “in front” of your computer. Running the VPN client on your router instead of running a client on your computer is one way to do this. You will still run into the same startup sequences when the router restarts, but that is usually less often than your computer. As I mentioned above, once the pings were complete, the packet capture shows encrypted traffic to the fastest IP. If an observer sees only encrypted packets and not a single unencrypted packet, that can be a sign there is a VPN in use. While the world is moving quickly towards encrypting as much data as possible on the web, there are still some requests which are typically not encrypted. Among these are DNS lookup queries, NNTP (time server) queries and a smattering of other protocol requests such as FTP and Telnet which are sometimes in use in some of our applications, but do not support encryption at all. A great deal of meaningful data can be obtained from a target by using seemingly trivial information. Many people spend a lot of time and effort mitigating what they perceive as the “important” stuff only to be identified by trivial information they did not think of. Some examples include the long memory of the internet that revealed Hillary Clinton’s email administrator was most likely a guy named Paul Combetta; Dread Pirate Roberts, AKA Ross Ulbricht, the alleged mastermind of the illegal Silk Road internet marketplace, was prosecuted largely due to data on his laptop that was physically taken from him while distracted at a public library. Less dramatically, observers can frequently use things like activity cycles to pin down a target’s timezone or the presence of special characters in a message to identify a language layout corresponding to a target’s country. There is no complete list of things to take into account when considering operational security because coming up with new ways to cross-reference data is mostly an exercise in imagination and resources. However, there are some specific things that pertain to packet capturing which can identify VPN use. Since VPN traffic is usually encrypted, it’s generally hidden from prying eyes. Encryption works because it is very hard to “brute force” encrypted data to expose its clear text content. In fact, breaking encryption is so hard that large scale surveillance projects sometimes just collect all the data they can in the hopes that they will be able to break the encryption at some future date when computer power increases, or they are able to obtain the keys that were used to encrypt the data. Perfect Forward Secrecy (PFS) is a method that can be used to prevent the latter scenario. Perfect Forward Secrecy re-generates the encryption keys used to encrypt the VPN traffic periodically. When a new key pair is generated, the previous pair is destroyed. This means that any collected encrypted packets cannot be decrypted at a later date because the key used to encrypt them no longer exists. Arguably, any repeating process would theoretically generate a repeated sequence of packets like this, but it can still be used as an indicator that PFS may be in play. Coupled with other data, this information could be enough to confirm a VPN connection. During the normal course of internet use, people and computers request data from many different sites. Each of those sites has a different IP address. When using a VPN, every single packet is destined to the VPN server. The VPN server peels the VPN encryption layer off each packet to reveal the real packet and then sends it on its way to its actual destination. The VPN server does the same with responses. It receives response packets, wraps them in an encryption layer, and then sends the packet to the user’s computer. A packet capture that shows a computer sending 100% of its traffic to a single IP is a good indicator that a VPN or proxy is in use. Psiphon is an internet censorship circumvention tool. It has an interesting function that can combat this to some degree. It has split tunnel mode which essentially only uses the Psiphon tunnel for traffic that leaves your own country. To see how this looks at the packet level, I launched Psiphon and tested two sites. I am in Canada and here’s a sample of traffic that is destined to our own .CA domain registrar. In this case, my destination is clearly visible in the packet capture. Note how the traffic destined for the US is sent to a Linode server instead of to comparitech.com. Linode is a very large server company and it’s not unusual at all to see traffic destined for a Linode server. 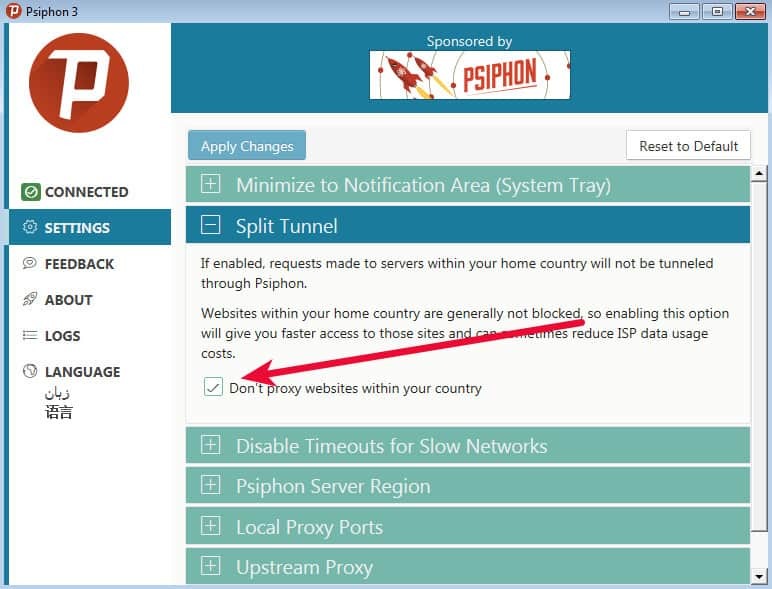 Psiphon further obfuscates that traffic by using an SSH tunnel to hide any trace of a VPN. As well, the reverse DNS (rDNS) for the Psiphon server at Linode does not betray its association to Psiphon; the rDNS just shows Linode owns the IP, which is expected. There is more on rDNS in the obfuscation section later on in this article. Although TCP networking is operating system agnostic, different operating systems create packets with some different values. For example, the default packet Time-To-Live (TTL) value varies in packets created on different systems. Most Windows system will set the packet TTL to 128 by default whereas most Linux systems will set it to 64. Since the TTL is a visible part of captured packet, it’s possible to determine which OS most likely created that packet. There are also other tell-tale signs in packet construction such as length and Maximum Segment Size (MSS) which also vary from operating system to operating system. The snippet below is part of a packet generated from a Windows system. Note the ttl 127 value on the last line is set to 127. This is because the TTL is expressed in number of “hops”. Every time a packet traverses a device such as a router, its TTL is decremented by one. In this case, the TTL started at 128 but since I captured it on the router—after one hop—it is now 127. However, I can still tell that it was never 64 so this is likely a packet created on a Windows system. A packet captured from a Linux machine has a TTL of 63 after its first hop. This is because most Linux machines set the initial value of the packet TTL to 64. But, so what? Why can it be important to know what operating system created a packet? If an observer has specialized knowledge of a target it can matter a lot. If the target is known to use Windows—perhaps as a member of large organization that uses Windows throughout—but packets captured from that target show that they were likely created on a Linux machine, that is a good indicator that a VPN or proxy of some kind is in use. It’s worth noting that virtually all VPN servers are run on Linux or Unix-like servers. It’s possible to adjust the packet parameters on most systems but very few people go to this length. There’s more to network analysis than just collecting packets. Ancillary processes such as DNS can play a role. Many VPN users are aware of DNS because sending DNS queries in the clear is one way for an observer to determine where you’re visiting or about to visit. However, fewer users are aware of Reverse DNS (rDNS). Much like DNS associates a domain name to an IP address, rDNS associates an IP address to an hostname and the hostname name usually identifies the owner of the IP. In addition, most programming libraries and operating systems come with some version of the standard gethostnameby*() functions which extend a system’s ability to associate IPs and hostnames. Reverse DNS is not as critical as “normal” DNS because rDNS plays no part in the routing of traffic. Rather, it is used primarily as a means to identify IP ownership. Only the owner of an IP address can associate an rDNS record to it. Therefore, checking the rDNS record of an IP address provides a reasonable assurance of who owns it, or at least, who the owner wants you to think owns it. Note that rDNS is not required and many IP addresses do not have rDNS entries at all. 46.207.58.216.in-addr.arpa domain name pointer fra16s24-in-f14.1e100.net. Google owns the 1e100.net domain, so we can see that this IP does in fact belong to Google. 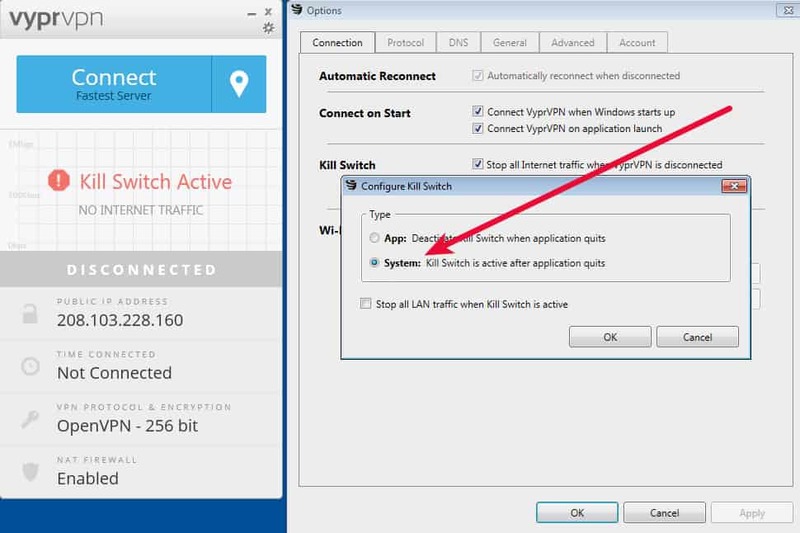 The IPVanish client for Windows provides three configurations: a standard OpenVPN connection, an OpenVPN connection using HTTPS, and an obfuscated connection. The packets above were captured during a session using the obfuscated OpenVPN connection setting, yet WireShark is still able to provide destination information. When determining VPN usage, there are very few “silver bullets”. It usually takes a number of techniques or observations to compile enough indicators which indicate a VPN is in use, and even then it can be hard to be 100% sure. Companies that have a vested interest in disallowing VPN usage such as Netflix and other streaming services have full-time teams dedicated to just this problem. In other cases, many eastern European and Middle Eastern countries) ban VPN usage and have similar teams to ferret out VPN users.